Daily Goodies | The writings of Clyde L. Pilkington, Jr. The Dabhar (pronounced “Davar”), reprinted by permission exclusively for our students, was a work over 40 years in the making. First released in 2005, this is a hyper-literal concordant translation of the Greek Scriptures into English. 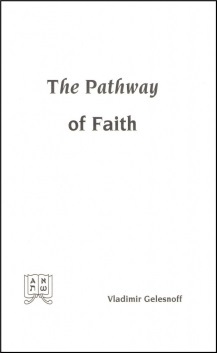 This writing presents the spiritual careers of Abraham, Isaac, Jacob and Joseph. God’s dealings with these four patriarchs are rich in lessons of permanent value. With exquisite, artless simplicity they demonstrate the frailty of our frame, accentuate the gentle forbearance, and illustrate the exhaustless grace of our heavenly Father. The One Body Was Himself! The Concordant Version of the Sacred Scriptures is a literal translation, seeking to carry over the original text through a consistent – concordant – English vocabulary. The type is large and readable, with boldface representing the actual English translation of the original Hebrew and Greek, and lightface showing English words added for idiomatic clarity or to reflect grammatical significance. Each page has wide margins. An abbreviation key is provided, and there is a comprehensive Explanatory Introduction as well as six pages of Instructions for Use. The procedures used in making the translation are as follows: By analyzing the contextual usages of each word, a single English word was first selected as its most suitable equivalent. Then, to achieve readability, some words were given a limited number of idiomatic variants that are harmonious with the sense derived from the investigations. English words used as the common translation of particular words, and even idiomatic variants, were not used for other words. Boldface type was used for words (or even parts of words) having exact counterparts, and lightface type was used for words (or parts of words) which were added to clarify the meaning of the respective word in the text. In addition, small symbols and abbreviations were inserted between or attached to words to represent omitted terms, to indicate grammatical features and the sources of emendations to the text. 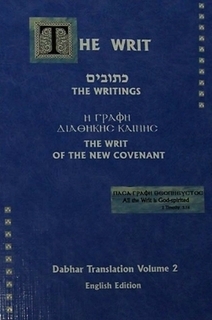 The hardcover version (only) is bound together with the Keyword Concordance, in which the English words used in the text are arranged alphabetically. It is at the same time a Greek concordance, because the entries, though listed in English form (according to the primary English Keywords), represent the original Greek words. In addition, the respective word in the Greek original is always added (in Roman characters) beside the English standard. At the end of each entry is given a list of all the words used in the Authorized (King James) Version for that Greek term. In addition, these AV terms appear in regular alphabetical order in this Concordance, together with a reference to the Concordant Keyword. 7.6 x 5.9 x 1.4, 992 pages. Complete One Volume Large Print Edition printed on thin “Bible paper” and hardbound with black imitation leather. Cover size: 10.75 x 7.125 x 2.5 (thick) 5.15 lbs. There are many myths in Christendom. They have managed to master their own form of mythology. Easter is an example of such a religious fable. If Easter is the celebration of the historical fact of our Lord Jesus Christ’s resurrection, then why does its date change every year? Historical dates do not fluctuate; but Easter Sunday can fall anywhere between March 22 and April 25. Have you ever wondered why? It is one of the glaring clues that something is seriously wrong with Christendom. The Western Christian religion can’t seem to get anything right when it comes to even the simplest of Scriptural truths. Have you ever really considered if there is any scriptural basis of Good Friday or Easter Sunrise Services that are so commonly observed by the religious community? Additionally, have you ever considered what Easter Rabbits and Easter Eggs have to do with the resurrection of Christ or teachings of God’s Word? Although millions of people are of the opinion that Easter and all of its customs are Christian and originated as a result of Christ’s resurrection, it is a historical fact that the observance of Easter long antedates Christianity by centuries. What is the importance of prophecy? Why study it? How do we interpret the prophetic Scriptures? These are the themes of this short work. 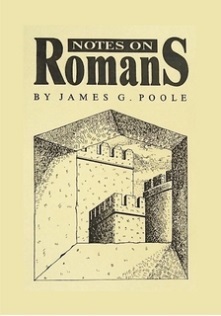 by — James G. Poole. Fundamental doctrines of the faith are made known in Romans. If our understanding is based solely on the four gospels, we have no justification, no (re)conciliation, and only an earthly expectation of the Kingdom of God. “In Christ Jesus” is a doctrine exclusive to Paul’s ministry. Paul tells us that God sees us in Christ, and not as we are in ourselves. We are shown in chapter 8:28-39 how that we are in God’s purpose, and that God is “for us.” James Poole was a contributor to Grace and Truth magazine. (#2176) 142 pages, facsimile paperback. The reader is enabled by this clear exposition to examine afresh the traditional ideas of the immortality of the Soul, Hell, and kindred subjects. It is not the author’s opinions that are put forward but what the Scriptures show, and that not in the light of restricted texts but all texts in their true context and setting. This publication is a compilation of the writings of A.E. Knoch on human destiny. 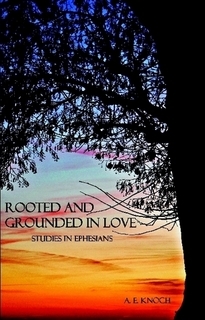 The author examines three major theories on this topic current among students of Scripture. The striking phrase “All in all,” which pertains to the vivification of all mankind in I Corinthians 15:28 and relates to the reconciliation of the entire intelligent creation in Ephesians 1:23, is discussed at length. Two extensive appendices are included, exploring the usage of the terms “eon” and “eonian” in the Scriptures. 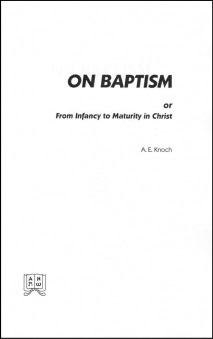 One of Knoch’s earliest works, this is a detailed study of baptism throughout the Scriptures. It discusses the meaning of baptism as it is associated with Israel and its rituals, the Kingdom and its prerequisites, and the Body of Christ with its baptism. This had a profound effect on E.W. Bullinger and he ran this in his periodical Things to Come in 1907 . A detailed study of the pinnacle of Paul’s revelation. (#2442) 380 pages, facsimil paperback.